Where will Alonso go in 2015? That has been the soap opera for the second half of the season. 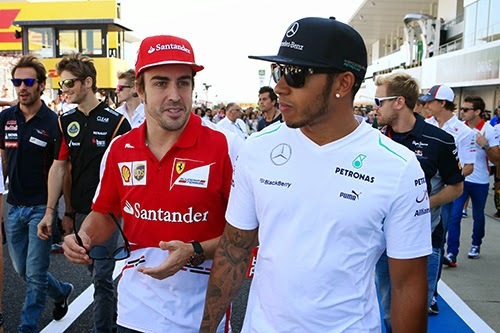 People are down on Fernando for keeping mum but there is a very simple explanation: Lewis Hamilton. When things were not going his way this past summer, Hamilton started making noises about his contract renewal with Mercedes. Mercedes, not wanting to lose their marquee driver came down hard on Nico after the Spa contact. Nico did not recover until the penultimate race of the season in Brazil. Score one for couch man Hamilton, tactic must have worked. Now as the season finale looms, Hamilton is still keeping the contract renewal over Mercedes's head. If he wins on Sunday he will renew with the additional leverage of a two time world champion. Should he lose, he will not stand around the Mercedes garage as Rosberg's sidekick and sign with Mclaren. Pressure's on Mercedes to avoid a DNF, a DNF in the final race of 2012 marked the end of his Mclaren days. That will free up a spot for Alonso at Mercedes and, as he himself said many times, it will be obvious why he waited. So, basically, both teams want Lewis ? well why not? McHonda wants a top driver, I'm sure given the history, they would rather get Lewis and Mercedes will want to retain the World champion. So, Alonso takes out Lewis on the first lap and gets himself a WDC next year? It almost makes more sense than Nando back at McLaren. I guess we'll have to wait and see just how obvious it really turns out to be. Lewis has been very astute about his career moves, even back in the cart days, I can't see him giving up the best seat in F1 and a bumper pay deal (one that will make Alonso cry) to go back to the light bulb factory. All the other teams are panicking about engine regs because they know how much of a march Merc really has stolen over them technically, they spent 3 years building a car to the 2014 spec, anyone who thinks it's just the Merc engine hasn't been paying attention to the quality of that chassis. TL;DR Why would a racer of Hamilton's quality give up a competitive advantage for an unknown quantity where he will have less freedom. Lewis is a hot house flower. He wants to be at a team where receives deferential treatment. I thinks he's politically cunning enough not to want to come across as DEMANDING he's #1, but he still wants to be TREATED as the #1. He expects that treatment to be afforded him, almost as a default. If Mercedes won't treat him as The Young King, then he'll go to whichever competitive team will. If I was Mercedes, I'd lower the boom on him: "Listen kiddo, you drive for us. You wan't to be the #1 driver? Then go out and BE the #1 driver, and we will treat you accordingly. Quite frankly, we think we could do well with either Nico, Fernando OR you in the seat. Your choice. Wanna stay here? Win. Wanna go somewhere else. Okay. Whatever you decide to do, just shut the hell up and drive." I don't know if Fernando will have a seat in Mercedes. Actually I think Mercedes would like to have someone like Valteri Bottas if HAM is off or at least that is how I would think of if Im mister Totto. You have a "stable" driver in ROS and a possible future quick FIN in BOT.